We’ve all been there. You have to be at the concert venue in an hour so you can get a good spot but you haven’t eaten dinner. And since most concert venues aren’t in typical dining destinations, you end up eating a dollar slice on the street. But in New York, you don’t have to be on time or have a full stomach before seeing a show -- we’ve rounded up the NYC concert venues with the best food, so you can have your Drake and your tacos, too. Even though Cafe Habana to Go and Habana Outpost BK are just minutes away from Barclays Center, Sean Meenan’s Cuban mini-chain has become so popular, the venue knew it needed one of its very own. And now there are two: one on the main concourse and one on the upper pavilion. 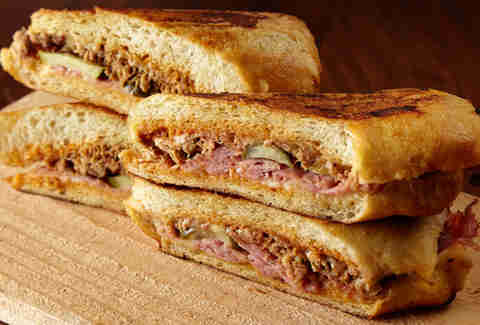 The menu is filled with authentic Cuban classics and pays homage to the culture -- from the pressed Cuban sandwich to the sweet grilled corn served with cotija cheese, chili powder, and lime. Other than at its brick-and-mortar location in Red Hook, Barclays Center is the only place you can get Top Chef alum Carla Hall’s hot chicken. 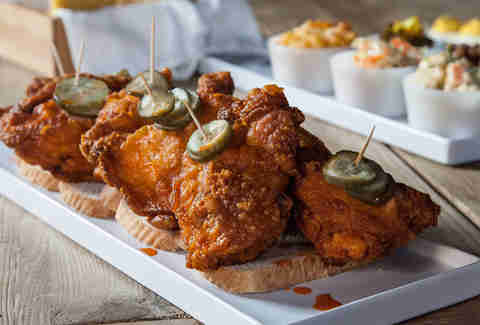 Traditionally, Nashville hot chicken is fried in an iron skillet and tossed in spicy cayenne paste; Hall takes hers a step further by slow brining it and brushing it with her secret hot oil recipe. Get it as hot --- or as Hall says, “hoot” --- as you want with a side of baked mac n’ cheese. Named after the California border town where its founders -- the Vendley brothers -- grew up, Calexico has been serving up twists on Mexican classics since it opened in New York a decade ago. What started as a SoHo food cart has since become four restaurants and one of the most sought-after vendors in Barclays Center. 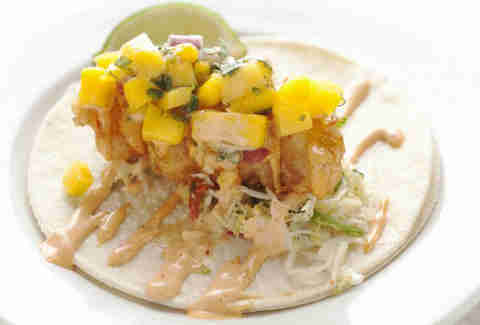 The move is to opt for the Baja fish tacos, served with a spicy slaw, mango salsa, and Calexico’s signature chipotle “crack” sauce. 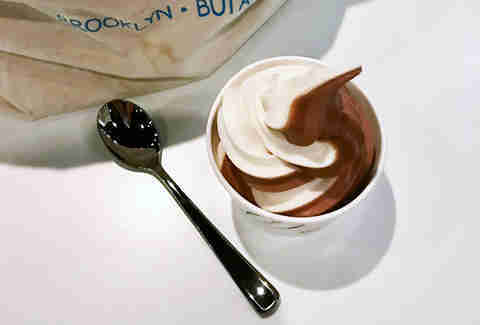 Brooklyn-based Blue Marble Ice Cream has Concretes and custard cups all over the Barclays Center. In addition to its stand on the main concourse, its products are offered at two other locations, so you can get that ice cream fix quick. Also, everything is made with certified organic ingredients, so you can feel okay about going back for seconds (and thirds). Go for a Concrete, AKA, frozen custard blended with chocolate chip cookies and/or brownies mixed in. With a little bit of every kind of cuisine -- from Mexican braised beef cheek tacos to Thai fried chicken -- the food at this South Williamsburg venue is just as eclectic as the musicians that take its stage nightly. Baby’s All Right opened in 2013 and hosts everything from small acoustic sessions to loud indie rockers. It’s a sit down restaurant, though, so it’s in your best interest to get there early, leaving yourself plenty of time to eat and drink before the show. 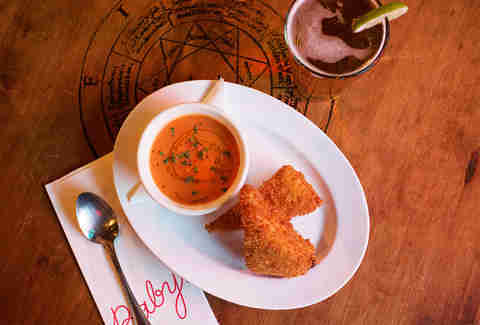 Be sure to get the Cheese Frenchee: a deep fried grilled cheese served with tomato soup. Only in New York can you go see a musical legend like Billy Joel and eat food from a two-time James Beard winner at the same time. 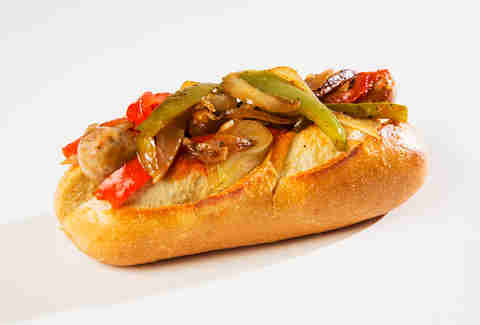 Sausage Boss by Andrew Carmellini debuted at the 49-year-old arena in 2011 as part of its high-end concessions makeover. Forget everything you think you know about a boring venue hot dog, because Carmellini’s brats are full meals -- for proof, order the AC’s Italian Link, a Pizzaiola sausage inspired by the famed chef’s heritage. It’s served with sweet peppers, onions, and Sicilian oregano. 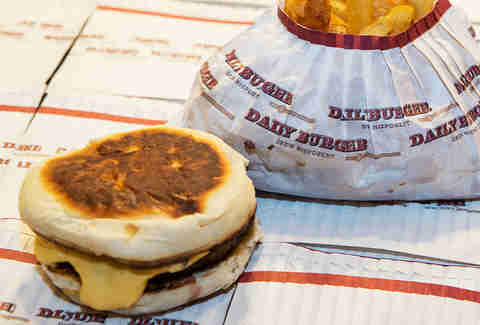 From Drew Nieporent (Tribeca Grill and Nobu), Daily Burger is an MSG exclusive, offering elevated burger concoctions made with a grilled (not griddled) blend of short rib, brisket, and Angus beef from Pat LaFrieda. For something beautifully simple but still flavorful, get the Daily Cheese Burger with bacon onion jam. From Momofuku maestro David Chang, Fuku is a fried chicken sandwich concept that got its own MSG spinoff last year. Fuku’s menu is slim, but there’s something for everyone -- including a variety of Milk Bar cookies. 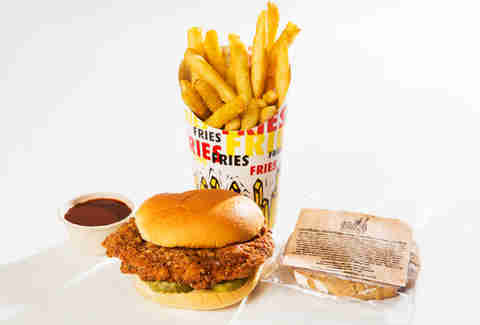 Be sure to get Fuku’s signature dish, the Spicy Fried Chicken Sandwich, which features a fried chicken thigh that's three sizes too large for the bun. If you’re looking for something really hearty -- like, skipped lunch and breakfast that day hearty -- there’s Hill Country Barbecue, which you can count on to bring all the flavor of Central Texas ‘cue to MSG. Everything’s smoked low and slow and Hill Country founder Marc Glosserman’s Texas roots go back four generations, so you know he’s the real deal. 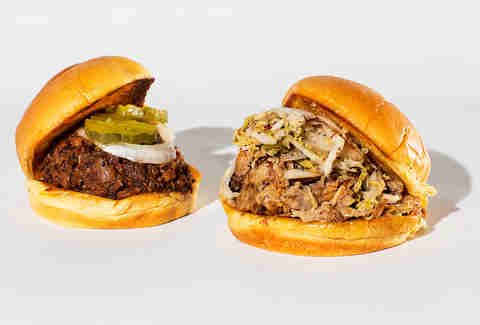 The go-to order here is a toss-up between the barbecue brisket sandwich and the slow-smoked pulled pork sandwich. Whichever you choose, make sure you also get a side of Longhorn cheddar mac & cheese. After 79 years and countless pastrami sandwiches, Carnegie Deli closed its landmark location in midtown Manhattan this past December. And as sad a day as that was in NYC’s history, the Jewish deli lives on via its licensed locations, including Madison Square Garden. 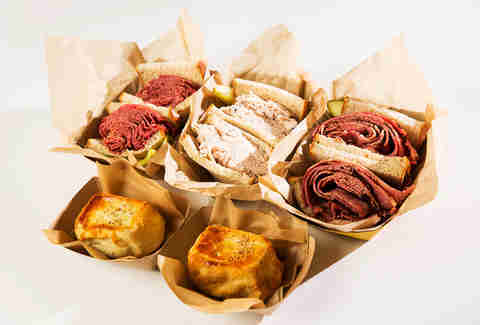 You might not be able to sit and enjoy matzo ball soup on a cold day like you used to, but the Garden serves up some of the classics like pastrami, corned beef, and turkey sandwiches. The newest dining option at the Garden (opened in January), Kobeyaki has been serving New Yorkers a healthier take on Japanese cuisine since 2011. Founder Brian Konopka believes in sustainability and carefully sourced ingredients above all else, which means Kobeyaki meat comes from animals that are raised humanely and fed 100% vegetarian diets, and everything from burgers to bowls to buns use recycled packaging. 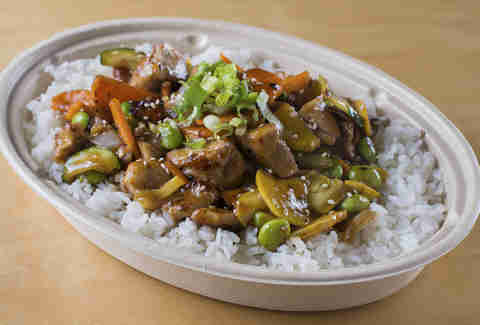 Opt for the chicken teriyaki rice bowl -- an elevated take on a classic. Part of the Public Theater, Joe’s Pub is one of the city’s hidden gems. 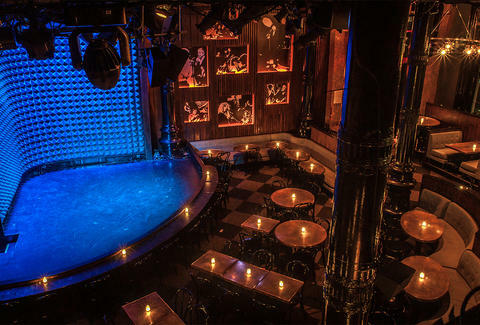 It’s the small stage where both Adele and Amy Winehouse made their U.S. headlining concert debuts, and it’s a great intimate space to see some big names (like David Byrne and Elvis Costello big) while enjoying some high-end eats. The menu got a serious overhaul by Andrew Carmellini in 2012 and features upscale items like roasted trout and smoked cauliflower cassoulet (alongside late-night favorites like lobster rolls and fried mac & cheese). 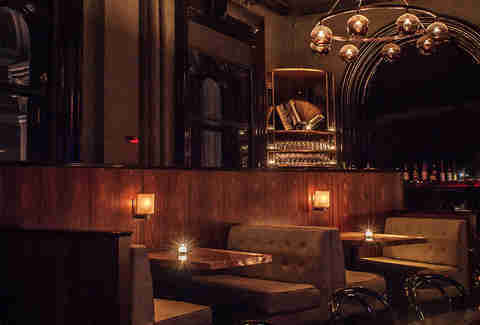 Nestled in the Flatiron District, this aptly named venue features an extensive and expertly curated list of whiskies, a small stage where jazz musicians perform every night, and a food menu to complement both your drink and your vibe. 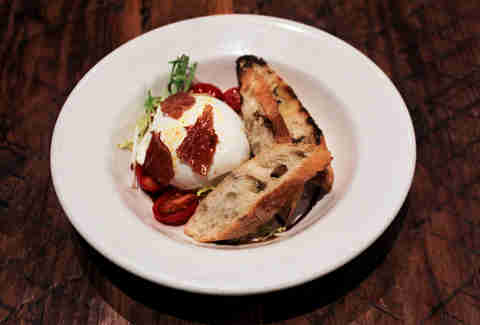 Whether you’re there for small bites like bone marrow served with crispy bread or a full meal of Boston cod or braised short ribs, one thing is for sure: Your evening is going to be decadent. Despite its name, people go to Brooklyn Bowl to do more than knock down a few pins. Not only is the stage here huge (meaning shorties are almost guaranteed a good view), but it’s the perfect pre-show dinner spot since there’s plenty of people-watching to do and tons of places to sit. Whether you’re looking for a giant basket of wings or a vegan or vegetarian option, the inclusive menu provided by Blue Ribbon has got something for everyone. 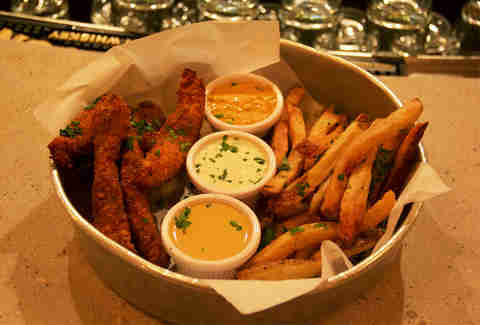 Get the fried chicken platter -- served with white bread and honey -- if you’re with a group, or just very ambitious. Renowned chef, restaurateur, and Top Chef Masters alum Marcus Samuelsson had one thing in mind when he opened this high-end eatery in Lincoln Center: That food brings people of all cultures and diversities together. That’s why the menu offers all different types of classic American cuisine -- from curry lentil and coconut rice to warm biscuits and lobster rolls, you’ll find it all at Samuelsson’s American Table. Everyone knows Pianos, the LES space where your buddy from college played his first live show right after he decided to become a musician. 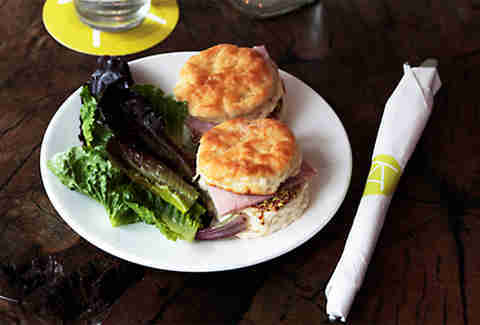 You know about the venue’s happy hour specials, but did you know about the equally great menu? Get there early so you can grab a bite before you head to the back room for a show. There are four different kinds of burgers, fried pickles, and plenty of other booze-absorbing comfort foods. City Winery is the perfect spot for an intimate evening of music and food -- and obviously, wine. The vino is made right there on site (you can even dine in the City Winery’s Barrel Room if you’re not seeing a show) and the food is paired to it perfectly -- from flatbreads made from City Winery's own wine lees (the dead yeast cells that remain in a wine after fermentation) to classic braised beef short ribs. The venue also boasts an impressive list of performers, with past acts including Norah Jones and Lee Ann Womack, so book some tickets ahead of time and get ready for a memorable evening. 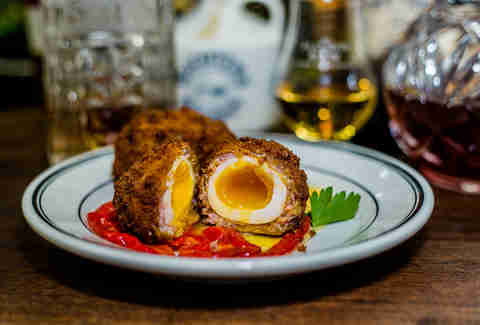 Samuelsson makes this list again because underneath his acclaimed Harlem restaurant Red Rooster is one of the city’s best kept secrets: Ginny’s Supper Club. Not only does the speakeasy feature cuisine from the renowned chef’s upstairs eatery, it's also got fantastic live performances.There are DJs performing regularly, gospel performances during brunch, and live jazz during Sunday dinner to “help stave off the late-weekend blues.” Opt for the Fried Yardbird for Two (bring a friend). 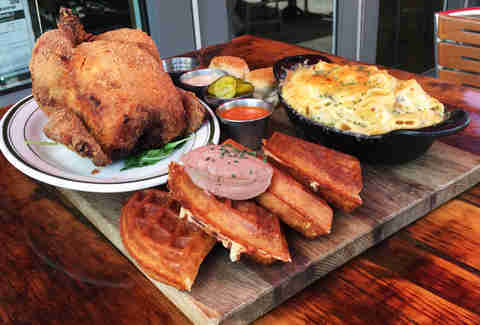 The whole fried chicken comes with mac & greens, mace gravy, liver butter, waffles, and Jou Jou biscuits -- so you get a little bit of everything.